Starting today, September 25th through the 27th and again October 2nd-4th, the color, music, spectacle, festivities and of course THE BEER from the world’s largest festival, can be sampled here, right in San Antonio, on the beautiful banks of The River Walk at Bier Garten Riverwalk, 126 Losoya St. San Antonio, Texas 78205. 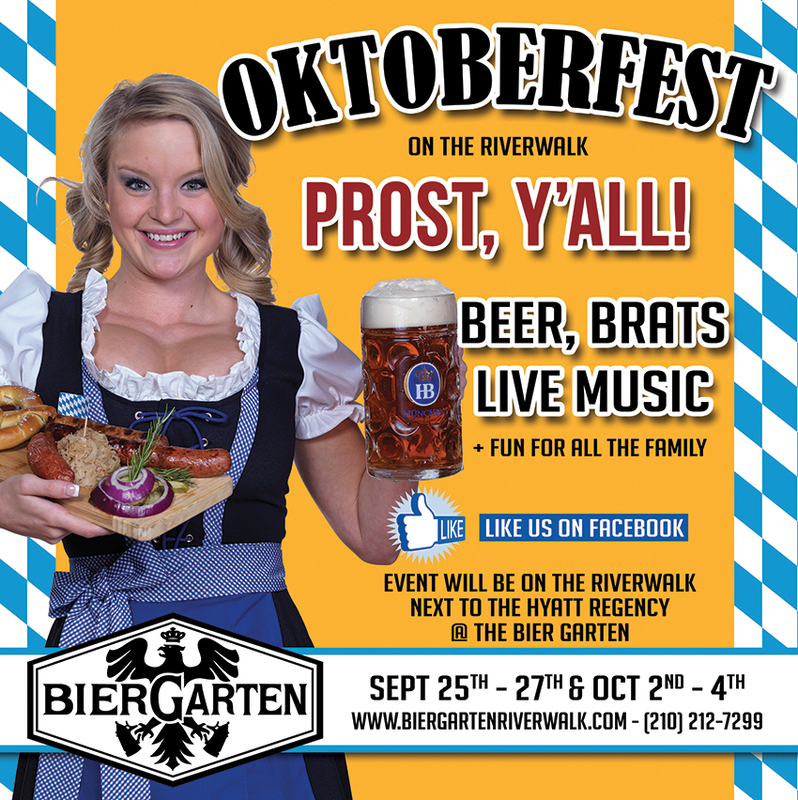 The Bier Garten Riverwalk launched its first Oktoberfest last year, to much acclaim and standing room only. The grand festival of German entertainment (including sing –a-longs, stein holding, alp horn blowing contests & live German music), a ceremonial keg tapping carried out by a local celebrity (last year we had Ursula Pari from KSAT 12 & Pat DiGiovanni, CEO of Centro San Antonio) and of course Oktoberfest dancing, singing, partying and good old Bavarian style FUN! And it’s back for 2015. The Bier Garten Riverwalk was brought to life by The Mad Dogs International, who brought the hugely successful Mad Dogs British Pub to The River Walk and has been entertaining loyal revelers since 1996 on the River in the atrium of The Hyatt Regency. The Bier Garten Riverwalk is a perfect tribute to the German heritage so richly woven into the history of San Antonio & South Texas. I have VIP passes your you! To enter, leave a comment below and/or share this post on Facebook. A winner will be selected at noon today! Good Luck!